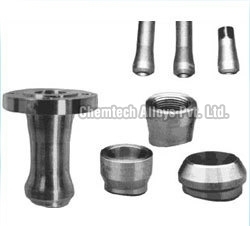 We, Chemtech Alloys, are a distinguished name amongst Stainless Steel Olets Manufacturers, Suppliers and Exporters. We are offering a wide range of Stainless Steel Olets that are manufactured using superior quality stainless steel. Our use of advanced technology by skilled workers contributes to the superior strength of the Stainless Steel Olets. Designed as per the industry standards, these Stainless Steel Olets are corrosion resistant and are available in a wide range of dimensions. We pride ourselves with our efficiency in supplying orders of all sizes in a time-bound manner. These Olets find extensive usage in various industries and therefore enjoy a great demand all over the world. We offer the Stainless Steel Olets at competitive prices. Available in various shapes and dimensions.